Boulevard Bistro is a family affair. Bret's wife Debbie was the hostess that greeted and seated us. Our server was daughter Candice and the elder daughter, Lauren, is sous chef to dad in the kitchen. Bret is, himself, an Elk Grove native. But he went off to the Bay area for several years to get his culinary degree and work in several restaurants before returning to the area in 2006. I was with three others this night with three of us being virgins to BB. As such, we all had an interest in trying as much as we could and ordering different dishes. We decided right off to order four of the small plates. While we waited we were happy to toast with some sparkling wine and sparkling water for me. What impressed me was that they kept refilling my sparkling water and I wasn't charged for it. I can't tell you how nice it is to have that offered to me as the non-drinker in the group. 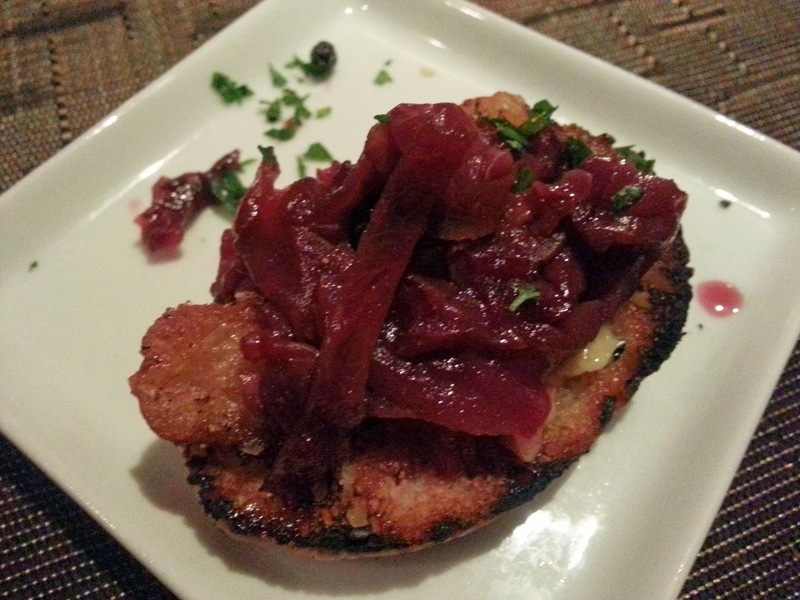 First up was a bruschetta with pork belly and pickled cabbage. The fatty pork was warm, a little salty, and melty on the toast with the nice counterbalance of crunch and tartness from the cabbage. 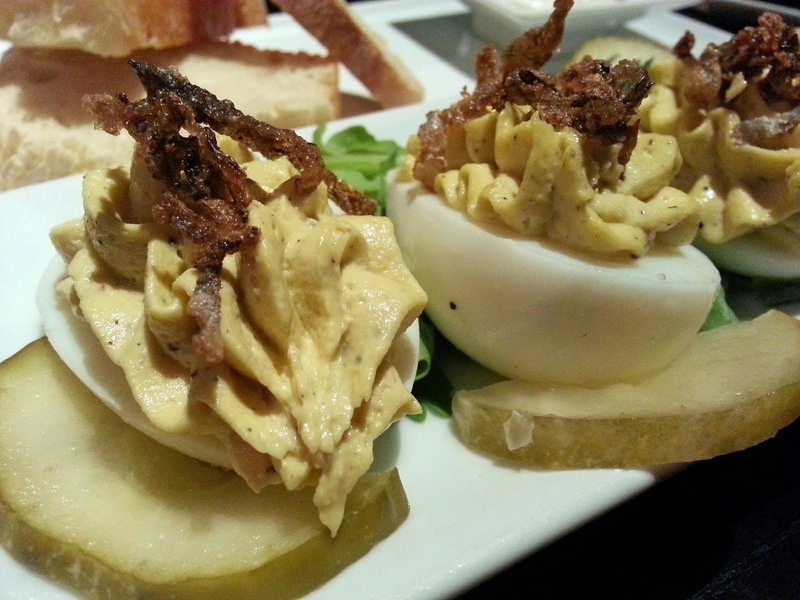 Next were the deviled eggs with the yolk blend so light and fluffy and topped with crispy bacon bits. 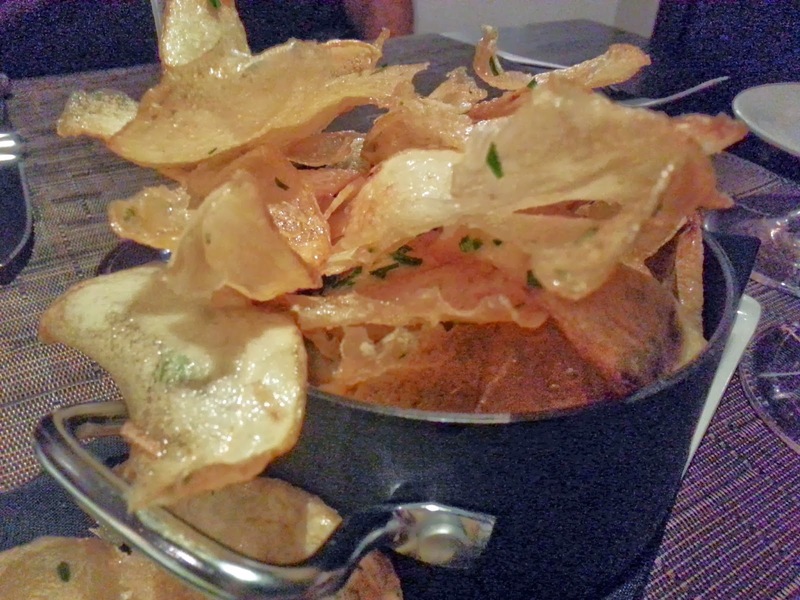 When I saw Truffle Chips on the menu, I wasn't sure what to expect. For some reason I was fixated on truffles/mushrooms as I don't care for mushrooms. Happily it was a wonderful bowl of homemade potato chips, super thin and crisp. The tossing in truffle oil is probably what made them to the greasy side, but that didn't stop me from munching them down. The fourth one I didn't get a picture of - our offal dish of bone marrow with a sweet mustard. It was a nice, sliced leg bone with deliciously decadent bone marrow to spread on toastettes. Debbie was very close to licking the bone. 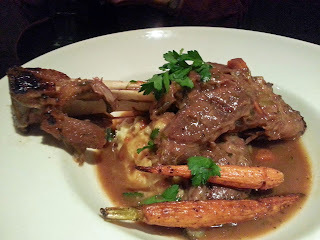 Susan enjoyed the Braised Lamb Shank, Mash Yukons, Green Pea, Radicchio, and Madeira Sauce. As you can see, the meat is already falling from the bone. 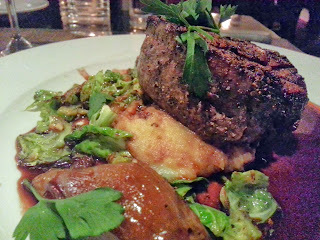 Debbie had the Filet Mignon, Mashed Yukon Gold Potatoes, Seasonal Vegetables (Brussels Sprouts) and a Peppercorn Sauce. She was raving on the sprouts and asked about them when Bret came out for a table visit. He said all he did was he pulls off all the leaves and then sautes them with butter and seasons with salt and pepper. Nothing fancy at all. Her filet, meanwhile, was a good two inches tall - not a small portion. Rick had the Braised Short Ribs, which I didn't get a picture of, and I had the Grilled Pork Chop. 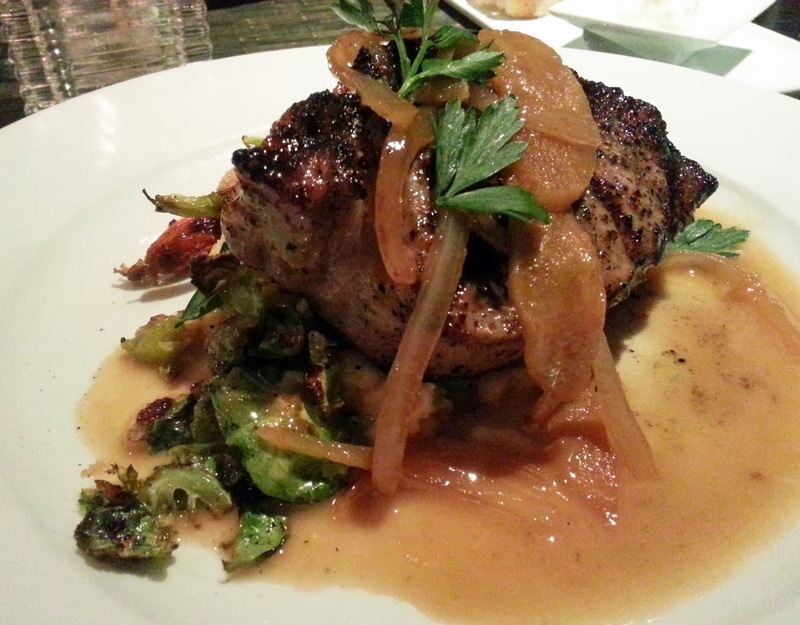 My pork chop was a good inch and a half thick. It had been brined to keep it nice and moist in the center. I almost finished it off but for one last bite. I was afraid I would explode with that last "wafer thin" bite a la Monty Python. 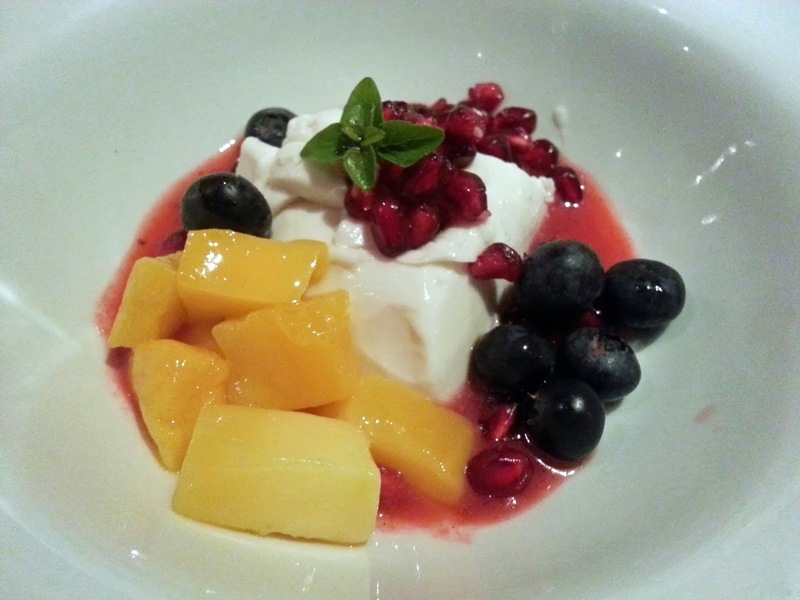 For dessert Susan and Rick shared a creme brulee while I had the coconut panna cotta with fruit. I have made this myself, so I wanted to see how theirs compared. It was tasty, but I found it too dense and firm compared to my light and giggly version. We ended up having spent over two hours enjoying good conversation, delicious and satisfying food, and some nice wine as well for the others. The suburbs shouldn't be left to suffer mediocre food. I'm glad that Elk Grove residents have their own special, fine dining establishment that they can rely on versus having to make the trek into town.